It is the end of the month, and I'm cleaning out some photos. Kaldi's "canned" coffee....a little too sweet for me. They also have a boxed tea, I didn't buy it because they didn't sell it in singles but I have a feeling that one might have been sweetened too. Cioccolato Andrea Pansa (Amalfi, Italy). A souvenir from one of Satoshi's co-workers (thank you!) Delicious dried fruit dipped in dark chocolate. Bodegas Norton Extra Brut, an Argentina sparkling wine. Very very dry but delicious, loved that it came with a straw too. Tiny cookies stuck together with chocolate. I think in Italian they mean "kiss of a lady" or something like that. These were very tasty. As I took this photo of a Mini, a woman (in the background) came running after me to find out what I was doing. I thought maybe it was her mini, but it wasn't. She lives in the condo complex where the Mini was parked and wondered what I was doing. We ended up having a nice chat on the way to the train station, though I think we scared the "beep" out of each other. I made some "kahlua milk" with some of my homemade coffee liqueur, a little sugar & milk. I also added some ice. The liqueur was quite strong but delicious. This soba was topped with bamboo shoots (which are in season now), some chicken & wakame (kelp). Very light and delicious. The Ippudo near our place has discontinued my favorite ramen, Karaka-men. So I was pleasantly surprised that they teamed up with Nissin and came up with an instant version. I tried it one rainy day for lunch, it was really spicy and tasted just like the one I've had at Ippudo. Some sakura (cherry blossoms) on our walk in Ikeda. Some sakura (cherry blossoms) on our walk in Hotarugaike. I thought I had seen all kinds of instruments travelling on the trains....this big bass drum tops it. I bought the Easytone shoes by Reebok. They aren't for playing sports in, but if you do a lot of walking they are worth it. For me, I think they work especially going up and down hills or stairs. Ciao Wine's Prosecco and Rosato sparkling wines. I liked the one cup servings. They are dry and a little fruity. We had a delicious April and are in the midst of Golden Week here though Satoshi unfortunately has to work here and there. Recently we've had some rainy (and cold) days. When I know in advance that the weather will be rainy, I usually stock up on groceries and stay indoors (sometimes I even stay in my pjs). For one rainy day, I made mini peanut butter chocolate cups. I've seen what I think are tedious versions where you "paint" the inside of the cups with the chocolate. I wasn't about to do this, so I did it "lazy man" style...dollop of melted chocolate (60% + a little milk chocolate) at the bottom, dollop of peanut butter, dollop or two of melted chocolate, put into refridge to cool. This was good but next time, I think I should add a little more peanut butter. For another rainy day, I was flipping through a magazine and got the idea for this one. Instead I melted some 80% dark chocolate and poured them over the bits of cookie and nuts. I'm making both versions again. They were delicious and the perfect size. *Today is Showa no Hi (Showa Day) It used to be called Tenno Tanjoobi (Emperor Hirohito's Birthday) but after he died, it was then changed to Showa no Hi. It is also the start of Golden Week. The other week when Satoshi and I went to Kobe, I stopped in Le Dimanche to pick up a few items. When I came out, I spotted Tor Road Deli. I had heard of them, but didn't realize they were right across the street from Le Dimanche. Satoshi and I popped in and picked up some bacon and bologna. Everything that we bought happened to be 30% off and came out to 977 yen (about US$9.77). I was surprised that the bacon had many slices, usually you can only get about 4 or 5 from other brands for just about the same price. The package of bacon had 10 slices and the bologna had 10 slices (I counted). Though there wasn't enough fat to make the bacon crisp. We had the bologna one morning as a bologna and cheese sandwich. They also gave us a packet of french mustard, it tasted like French's yellow mustard and went nicely with the bologna. This deli was different from what I imagined a deli to be like; more meats and no salads. I think in French they call this type of deli a charcuterie. They even have a sandwich room on the 2nd floor, which I think you can order and eat sandwiches there. I'm glad we got to try some of their items. I will buy from them the next time I go to Hankyu department store or Kobe. There is a food trend going on here...it is called gu-iri ra-yu (goo-ee-li lah-you) or chili oil with "stuff" in it. It all started with an article about it in a magazine for housewives...now you can't even buy the original item because the company is trying to keep up with the demand. So one morning on television, I saw a recipe on how to make my own. Here is the recipe if you want to try. Gu-iri Ra-yu : Adapted from Komoda Kinya's recipe shown on "Tokudane"
Store in a glass jar and take out of the refridge a little before using. NOTES:You can change the measurements, adding more or less. You could even add some scallions and or ginger skins. I think the combinations are endless! The ones I've seen on television are red, red, RED. Mine didn't turn out as red, but this thing has KICK! It starts off sweet then the chili kicks in, you cough a little and then eat some more. The sliced garlic actually tasted more like sliced almonds. *For the garlic, try to slice it thin first, rinse, dry well then fry, this way you will have some crunch. If you can find some garlic that is already dried and sliced use that instead, it will save you some time. If you do use garlic that is already dried and sliced, just break it up with your hands into chunky bits. So far, we've eaten this on tofu with green onions...perfect for a light entree or pupu (appetizer). And mixed with some ground pork and tofu as a kind of mabo tofu. I also sauteed some shrimp and green onions with it. This is quite salty and spicy so make sure to serve lots of rice (and beer). Recently I was reading a novel, "Tough Cookie", the author often gives recipes of some of the delicious food described throughout the book. In this particular book, a spicy dip made with velveeta cheese was mentioned. Processed cheeses can be found here, but since I had some Fromage Roux, a creamy French washed rind cheese, and since I had some leftover taco filling from taco rice, I nuked the two with some salsa. It was delicious on toasted bread! and probably would have been better if we had had some tortilla chips. In the same book, there was a recipe for muffins with marmalade in them. I remembered I had some marmalade in my freezer, so I added it to the muffin recipe I always use along with some chopped almonds. I baked it a little longer than the original recipe stated because of the jam--I had sandwiched the jam between the batter. I think I should have mixed the jam into the batter instead. Still, I liked this, the marmalade originally wasn't too sweet, so it matched nicely with the muffin. Once when Satoshi and I had lunch at Kamizono, they gave us some coffee liqueur before our meal. It was my first time having a "little shot" of coffee liqueur but it was delicious. I figured if I could make my own vanilla extract, it shouldn't be too hard to make coffee liqueur. This recipe is adapted from something I found on a Japanese site. What I like about it was that it didn't use sugar. If you want to sweeten it up do so with your sweetner of choice. Makes about 1/2 a cup. Steep in a glass jar for 8 weeks or longer. NOTES: I used some medium roast beans, and after 8 weeks, it smells wonderful. Besides cocktails, any ideas what I could use this for? I am laser beaming this rant to the lady, who decided she needed to run while pushing her baby stroller...through a crowd of people. On Tuesday, I was walking to my French class. It was nearly 10 a.m., just about the time for the department stores in Umeda to open. There were many people, not as many as during the weekend, but still quite a lot. A chime sounded indicating that the store was about to open. The lady with the baby stroller took this chime to be her starting gun and off she went. Running and pushing the stroller (with her baby in it!) through the crowd, zigging and zagging, while people were trying to get out of her way. What she was purchasing? Cake. The said cake is quite famous in Osaka and around Japan and the lines for them are kinda nuts. But I had to shake my head, nothing can be so (delicious or) important where you need to hurt others and endanger the safety of your child in the process. Then as I passed another department store, their line for a popular rusk (pictured) wound around their store. And then she zipped passed me, people dodging her, all so she could stand and wait for about an hour (or more) to buy these rusk. When I first came to Japan, I didn't know what rusk were. It is a piece of baguette, sliced thin and toasted. Sometimes it is covered with butter and baked with sugar. I've even seen a version with garlic butter. The particular version that she was running for is covered with chocolate. I admit that I've stood in lines to buy popular food items, definitely not for hours on end though. And definitely have never "run" to buy them either. I dunno if it was because the rusk was covered in white chocolate, or maybe it was because I thought it quite ridiculous to stand in line for hours for something you could probably make at home (or order online), but meh, it wasn't "all that". This past Saturday when I went to one of my favorite fruit/veg stands, they had these strawberries...195 yen (about US$1.95) a basket! The sign said, "perfect for jam! "...so I bought 2 baskets. The berries were ripe, very ripe. For strawberry jam, I use this recipe, the first time I tried the recipe I microwaved it as the directions said, but now I cook it on the stove. This time I also squeezed some lemon juice onto the berries. For the 2 baskets, I used 5 tablespoons of sugar and it was just the right sweetness. So far, we've had some on plain yogurt. And on pancakes using this recipe. This time I added some ground flax seed to the batter. It was my first time planting freesia. Last year, after putting the tiny bulbs into several pots, the plants started off with a lot of leaves. Then early in the year, there were tiny buds. Last week, the plants "perked" up...kind like they were standing at attention (ten-hut!). And the buds looked like they were getting fuller, fatter. The weather has been teetering between warm and very cold. I was kind of worried that the freesia may not make it. Over the weekend, the temperature got warmer and they started to bloom! Can you believe that one cutting (I don't know the correct term) of freesia usually goes for about 300 to 400 yen (about US$3-4) at the florists here in Osaka? I love the fragrance of these blooms, a very sweet fragrance. So far I've cut 10! and we're enjoying them on our dining table and in the bathroom. Has it started looking like Spring where you are? Ooh, and Happy Earth Day! During the week, Satoshi usually comes home from work really late. Like 23:00 or 24:00 (sometimes even later and it isn't because he is out drinking with clients or friends, like most "salarymen" (business men) are). To feed him a "regular sized" meal at that late hour would be asking for trouble. Most nights I feed him veggies or soup. Or if it is really late, like after midnight, just a glass of milk. Kinda sad, since I know he is starving, but unless he comes home earlier, I don't want to risk him getting indigestion or other illnesses from eating so late. Plus, feeding him a regular meal at that late hour, he wouldn't be hungry the next morning. So most mornings, I feed him "dinner". This could be loco moco with a side of chili. Loco moco is one of Satoshi's favorites from Hawaii. I cheat with package gravy but he is still happy with it. Now that spring onions are in season, sauteed, they go nicely with the loco moco. One morning was taco rice. A favorite of ours from Okinawa. I think he likes the combination of chips and salsa, but I like it because it tastes "mexican". Sometimes I serve him mentaiko (spicy pollack roe) or fish. Paired with rice and some tsukemono (pickled veggies). Sometimes natto (fermented soy beans). I try to feed him rice rather than bread because that is what he grew up on. I also try to give him fresh fruit and some yogurt. I know it doesn't match with Japanese foods, but it is probably the only meal for him to get some fruit and calcium in. Keeping late hours during the week, I try to squeeze in as many zzs as I can and usually wake up a half hour before Satoshi's alarm goes off. Because of the limited time in the morning, I usually cook what I will serve him the day before, then heat it up for his breakfast, especially if it is something complicated or takes some time to prepare. In the morning, I also make a musubi for him to take with him to work which he usually eats at about 19:00 or 20:00 to tide him over until he comes home for "dinner". Before we met, Satoshi's breakfast was a cup of coffee. Now that we are married, and he eats "breakfast", he says he can't live without it. By the way, my breakfast is usually oatmeal, toast or granola, fruit & yogurt and my dinner is usually what Satoshi had for "breakfast". I think I've asked you before, but what do you eat in the morning? Sunday, it was sunny, but with a haze. We headed to Kobe since I wanted Satoshi to experience Freundlieb. After talking Satoshi out of ordering a salad and sandwich, we shared the chef salad and Satoshi had the club house sandwich. We were lucky that we beat the lunch crowd too. He was happy with the food and that he didn't order both items. After lunch, we walked around the Ijinkan area. The Ijinkan area has homes of foreign consulate generals and commerce traders from the Meiji period which are located on the hillside of Kobe. Most are not used as homes anymore but have been transformed into museums or cafes. 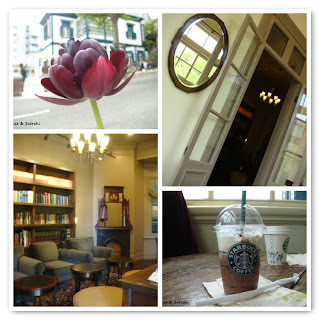 I had heard that there was a Starbucks located inside one of these renovated homes, so I wanted to check it out. The drinks and food are the same as any other Starbucks in Japan, but the atmosphere is definitely more relaxing and you can't hear a lot of chatter. In fact, we had to leave before Satoshi fell asleep! The weather was nice, we had a lot to eat and see. It was a nice Sunday. The first time I tried this recipe, I didn't know what I did wrong. But as I surfed around the web, I had a feeling that I may not have creamed the butter well. So, this time around, I made sure that I creamed the butter well. But when I added the flour...it was still really dry. Not as crumbly as my first attempt but dry. I followed some of your tips and added some milk working it in and the dough came together. Then chilled the dough for awhile and baked them off. They were looking kind of pale while baking, so I baked them for quite a while longer than the directions stated. I think these came out better than my first attempt, though I probably wouldn't make these again. At least I know that it probably was due to the creaming step, now I can move on to something else. Have a good week, we're supposed to have warmer temps but rain and clouds! A red mini (with a right flat) decorates the entrance to a hair salon. Down the street from that Mini was this sporty blue one. This souped up blue one I spotted from the train then snapped it while walking home. This white Mini I found by accident on one of my afternoon walks. And found this maroon one right around the corner from the white one above. This yellow Porsche, we saw at Satsukiyama Park. It looks rather new and very sporty. Lastly, a Nissan Pao that I spotted in Kobe, cute yeah? Last month, when we got together for FIL's memorial service. We received a box of sweets from MIL as a "thank you". Inside, were these coffee flavored macaron outsides. They were quite teeny. Mini macs if you will. Maybe an inch in diameter. I melted some dark chocolate and tried putting them in the middle. Because the chocolate was thin and liquidy, it didn't have that "umph" factor. And with the mac outsides being coffee, the whole thing was quite bitter. So, I scooped some peanut butter chocolate spread that I had in my refridge. And voila! A mini macaron. The outside of the macaron was crispy though I am more used to the chewy type. We'll be enjoying these for awhile.